Endless horror games. Endless nightmares. 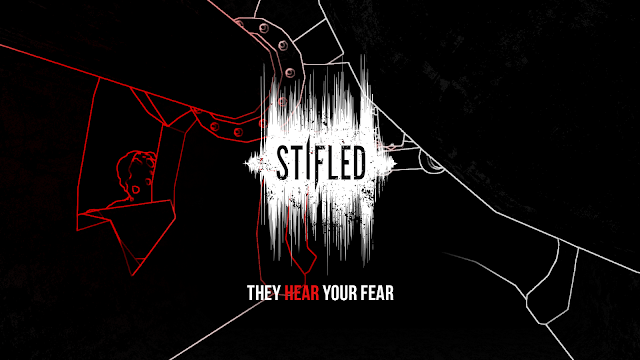 In case you haven't been listening to the eerie echoes of the indie horror scene, Stifled is the first commercial game in the works from Gattai Games, a Singapore-based studio already on many radars after their student project, Lurking, won 'Best Student Game' (among other awards) at China's Independent Games Festival in 2014. Stifled is considered the spiritual successor to this award-winning game, which had players using echo-location to explore and survive in a world of blackness, and so I was understandably excited when I was offered the chance to preview the game. Here's what I thought. The demo opens on a car crash — your own, in fact. 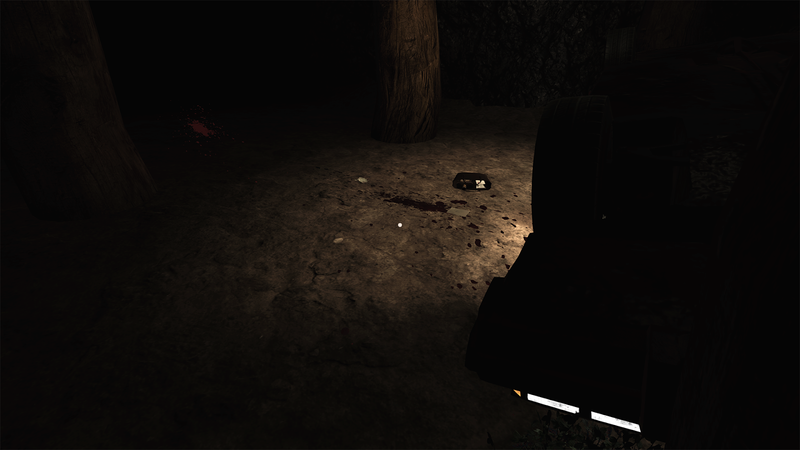 You take control inside a flipped car and crawl your way out into a pitch-black forest. The only reason the darkness hasn't consumed you already is that your car is on fire. Silver linings, eh? Without any other option, you head off into the true darkness of the forest. 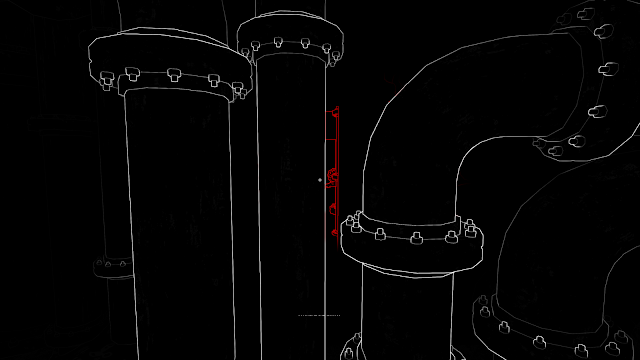 Once inside the blackness, the game's most important feature comes into play; echo-location. After making a noise — by throwing an object, holding down space, or even speaking into the mic — the environment around you is reflected back at you in clean, white lines. It's still pretty easy to see what everything is, and it works well enough for bats, right? Soon enough you stumble across a metal door leading down into some sort of sewage system. It's the only option. Of course, that's also where horrors await you... After sending out one of many echo-location scans, which has become second nature by this point, something answers your call. Something in the darkness screams out and the black is splashed with angry red. It sounds pained and almost child-like. Exploring becomes tense from this point onwards. There's a constant balance of wanting to be hidden from the unknown creature, yet wanting, and needing, to see the world around you. In this respect, Stifled feels almost like a spiritual successor to Dark Echo, which uses a similar method of echo-location (from a top-down perspective) and has entertained and terrified me on many a train journey. 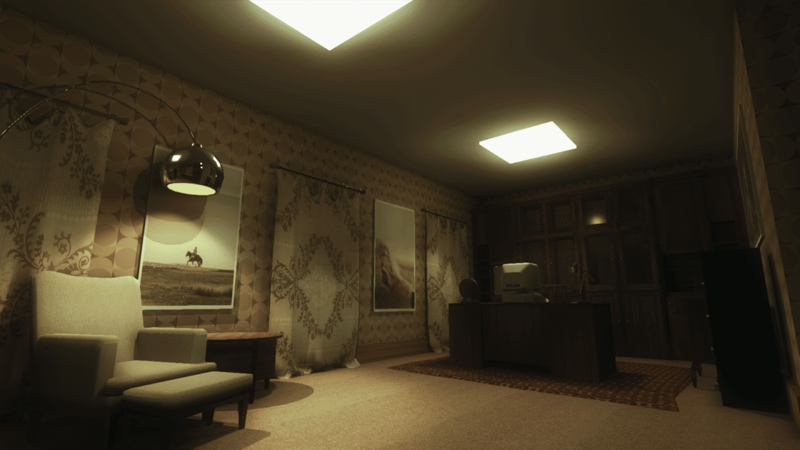 However, you don't to actually see the reason for your fear in Dark Echo, and this adds an entirely new layer to Stifled. Seeing the creature — a writhing, disturbed, humanoid being — evokes memories of The Last of Us and SOMA, which is a massive compliment, if you ask me. In both, you are in danger of being killed by a creature, yet you also wish you could get just a little closer to understand exactly what it is. In both cases, it is not something that was born to kill. It began as human, and was infected. Perhaps this creature is the same. It didn't seem like it wanted to kill, exactly. Maybe it's own human instincts are just "stifled" by some overriding need to murder. That's not just a great pun, I swear. There's something deeper within this creature's aggression and anguish, which I hope to uncover later in the game. In order to get far enough to uncover this, though, you'll need to make sure that you're playing in a quiet room. With the mic feature on — a great, unique feature — any noise can give away your position and get you killed. All it takes is a friendly "How was your day?" and... dead. If you're expecting other people to be in the same room while playing, I'd highly recommend turning this feature off. You can always switch it on later for the full Stifled experience. What an experience it can be, too. At its core are extremely tense cat and mouse scenarios with the creature, throwing rocks and cans as far away as possible to distract it from finding you in the corner you accidentally backed yourself into. This sends it screeching after whatever made the sound. It's an awful, bone-chilling scream, but it's fine as long as it's heading in the opposite direction. A door came into sight, and as it grew nearer, it opened. Inside it, some kind of office. Small, well-kept, full of dark wooden furniture and books. On the desk, a map and a leaflet. My inferior knowledge of geography meant that the map was useless, but the leaflet offered a little more in the way of information. The leaflet was for an orphanage. What could this mean for the full game? Based on previous trailers for Stifled, I think we'll get to explore this orphanage upon release, no doubt long abandoned by everything but creep factors. Admittedly, within all of this silhouetted tension, there are still a few outlined bugs to squash. The main issue I found, and the only one to actually affect gameplay, was that I would occasionally get stuck in objects or walls. Though I was able to free myself every time, the problem came with the fact that getting stuck caused the protagonist to bounce up and down on the spot. It was as if I'd picked up a megaphone and started broadcasting my location to anything that might have been listening. Uhoh. My only other feedback was entirely subjective and had no influence on the rest of the demo. Firstly, I thought that the opening scene - as one of the only areas to be shown in the light - could have been been more visually pleasing. Everything looked notably average with muddy textures, and I was glad to head into the clean lines of the darkness. This wasn't reflected in the office, though, which looked much more polished. Also, there are times when you'll occasionally hear static throughout the demo, and while it's jarring as desired, it sometimes reached volumes that made me feel as if I was being plunged underwater. Too much more and I'd have wanted to switch to speakers for a while, thereby stepping back slightly from the immersive sound design that comes with good horror. Sure, there's still a little work to do, most notably around getting stuck in objects in the loudest way possible, but there's a lot of potential here for something special. In just a short demo, Stifled combined things I love about a few different games, and created something new of its own. The echo-location I loved from Dark Echo is here, as is the stealth from The Last of Us and SOMA, in addition to the unshakeable feeling that the creature hunting me down is unmistakably human and in pain. That won't stop it from tearing me limb from limb, I'm sure, but it adds another level to the fear. That's what good horror is able to do, and it just may be something that Stifled does extremely well. 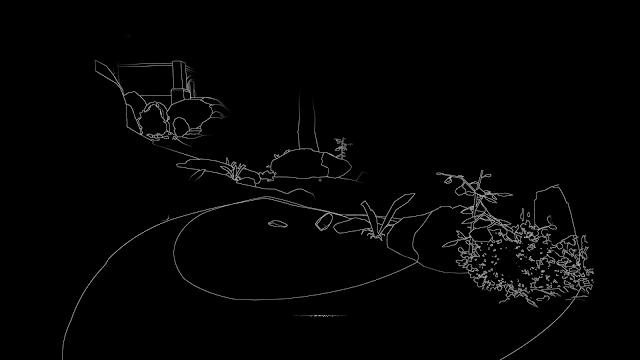 If you have been listening, you may have heard that Stifled was recently Greenlit. Not only that, but the game will be coming to Playstation 4 as a Playstation VR game. It seems like a horrifying match made in heaven, so that only adds to my excitement. While I await Stifled's full release, I'll be bouncing off the walls in more ways than one, hoping that nothing else is listening in. Want to feature your horror? Get in touch!